Some of you are in a position where living on less than you make seems like a pipe dream right now. And $70,000? That’s more than three times your current income and more money than you could ever dream of making in a year. You might be feeling discouraged just thinking about how low your income is in comparison and how hard you’re working right now to just try to barely break even. I well remember the days when I felt so desperate. We were barely squeaking by. I was pregnant with our first child. Jesse was in law school and working part-time. I was so sick with my pregnancy that I was unable to continue working and I wanted to stay home with our baby after she was born. But it all felt so impossible. I was trying so hard to come up with something I could do from home and all my ideas were falling flat on their face. I was scared and grasping at any straw I could find. I was praying–often pleading–and asking God to provide for us. There were so many moments when I wanted to give into hopelessness. But, by the grace of God, I kept going, even when everything seemed so dark. And I want to encourage you to do the same. Do something–even if it seems miniscule. Set microscopic goals. Check out books from the library on how to save money or increase your income. Read blogs or articles on the internet that will teach and inspire you. Surround yourself with positive influences who will encourage and motivate you. Get up and exercise. Laugh, smile and sing… even when you don’t feel like it. These can all be huge antidotes for warding off discouragement. Choose to be thankful, even when life feels so overwhelming. 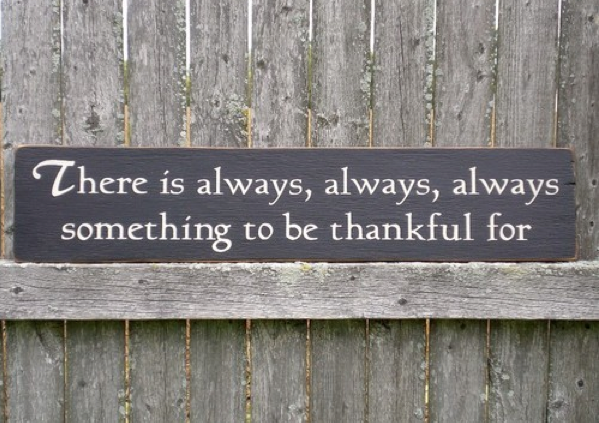 Find something–anything–to be thankful for. There is always someone who would want to be in your shoes. Make the most of your situation, even when it seems like you have so little to work with. And never, never give up. Ever. So very true! Thanks for your encouragement as always! Crystal, I have read your blog for several months now, and your words of inspiration always seem to come at the right time. Thank you for your constant words of encouragement! I totally agree. Where you were *then* Crystal is where I am at *now*. Many of these posts always seem to be timed to go right along with my life! Thanks for posting… sometimes even well-thought out words on a blog from someone you’ve never met can be a lighthouse in a storm! I love when you say “there is always someone who would want to be in your shoes”. As bad as my situation seems right now. At least I have a roof over my head and food to eat every day. Yes, I’m scared that keeping these things could become difficult. But I have to have faith that God will see us through this. 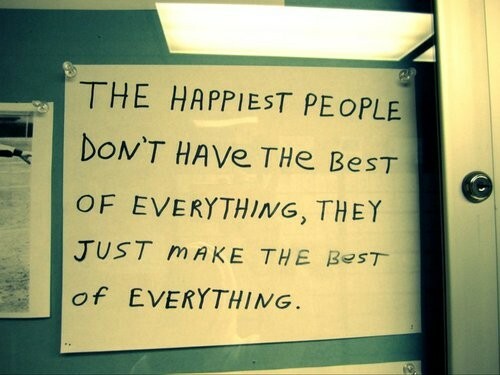 There truly is always something to be thankful for. I always say there is somebody who would love to have my problems. When I’m upset about problems at work, I say well there are many people who are unemployed who would love to complain about their jobs. When my kids drive me crazy, I say there are people who can’t have kids that would give anything to be a parent and deal with the good and bad. It is all about attitude. I hate to see any negative comments on any of your articles, as you give so much of yourself to help us readers & others. That article about the $70,000 paycut may help someone, and I am glad you posted it! The portion you outlined is good advice, and I think people are taking it the wrong way. I just want to say how thankful I am for you today! I have been reading your book & I am excited to put some of these tips into motion! I thought I was doing pretty good already, but I know I can do better, especially with the time budget! We are just rounding out our first year as a military family, and while we make more now than we ever have, we have also moved 700 miles away to an area that is much more expensive so I find myself still struggling with our budget, and your book is really going to help. It’s an added & amazing bonus the gifts (Dave Ramsey & platter) you have given away today, and I am so thankful! This article to never give up hits me more personally than financially, as my husband has been ill for close to a year now with no end in sight. It’s hard not to get down sometimes, but I know it will get better! Reading your blog gives me a little boost sometimes when I really need it, and for that I thank you! Thanks for your family’s service! Thank you so much for the sacrifices you make for us while serving our country!!! claudia- please email me – lwyatt21 at gmail dot com. I know of a couple of work from home gigs you may be interested in to get you through this rough patch. Thanks so much! I needed to read this tonight! This really came at just the right moment. Thank you for the inspiration when I need it the most. It always seems like you know exactly when I’m feeling overwhelmed. As always Crystal, your words are very gracious and very encouraging. I visit your blog everyday, and I always feel refresh every time I read your articles. It has helped me to become more humble and thankful for what God provides daily for our family. Thanks for everything you do here! I guess i was up late for a reason. I really needed to read tis tonight! We have a baby on the way any day and its been rough. Thank you for this post today, it is quite timely. I guess you could say we took a 100k pay cut, my job was eliminated 18 months ago. While I am grateful for the time I have had with my son, I am angry, bitter and frustrated about so much more. I do my best daily not to let it be the dark shadow over our family but I can’t help it. I miss the life we had. My husband and I were lying in bed last night dreaming of when we have resources again, the first thing we plan to do is go to our favorite restaurant, and order without reserve. Mostly I miss the the travel, I have never been, nor will I ever be a “homebody”. I had so many dreams to show my son the world, and now it seems we are imprisoned in our neighborhood. Dr. Phil likes to say everyone has a personal “currency”, well mine is traveling. I could live in constant motion, never staying more than 6 months in one place, and now… here I sit. I pray, I plead, I have flown from one side of the US to the other interviewing for jobs, to only hear nothing in return. I ponder the futility of all the education I invested in over the years. Some days I just don’t see light at the end of my tunnel. You’re not alone. We also have gone from being very well off financially to wondering if we’ll have to move our family in with extended family or if our children will be able to goto college. It’s been 5 years of cutting back & it has been quite painful. I was bitter for a moment & wishing we would’ve saved more when times were good. Thank you for this. I am a college student. I live on my own, supporting myself. Sometimes it feels like there is just too much demanding some part of me, whether it is work, school, my family, my bills, something is always demanding some part of me. Your blog and inspiration are greatly needed and appreciated. Thank you again. Let me add to the chorus of “thank you”s for this post, which I also badly needed to read today. Like many others, we are struggling financially — but we are also so, so very blessed. I especially love when you said “Laugh, smile and sing… even when you don’t feel like it. These can all be huge antidotes for warding off discouragement.” My personality is such that I can often find myself sliding into a hole of discouragement. But all it takes is a few laughs (even if I’m kind of faking it), and a little cheer (again, even faked), and a little playtime with my kids to make life seem a little brighter again. Thanks for all of your posts and encouragement, Crystal. I am a single mom of 4, who recently left an “unhealthy” (to say the least) relationship with the father of my children. I was a stay-at-home mom, and we were already struggling to make ends meet. Now, I have no income and no savings. I have literally been selling everything I can think of, in order to come up with money for our bills this month. It has been stressful and, at times, makes me feel so hopeless. Then, I look at my 4 amazing, healthy children, and I know that I have so much to be grateful for. I am thankful for each day that we have shelter, food, and our health. I know things will get better eventually, but when I’m having moments where panic and desperation set in, reading posts like this help me to feel like it will all work out in the end. Thank you so much ! Found this article just as uplifting as the other.Many have said it isn’t the amount of money one makes it what you do with what you have and how you handle any job loss.I remember a few months back you had a post from a lady who knew at least 6 months in advance that her husband was going to lose his job.She was unsure of what to do as this was going to be new territory for her family. She was given lots of good advice and same thing as now many couldn’t relate to her that she knew in advance about a job loss because most of know only when the husband calls home and said I was laid off. Thank you! I’ve been feeling very discouraged this week in my attempt to earn an income from doing what I love – blogging. It feels like I’m working and working, and seeing zero results. Thanks for ending this week on an encouraging note. Great words of advice! There are so many ideas I have that I never act on – imagine how much we could accomplish if all of us just did a little something extra each day! Thank you! I had a college professor for Child Development whose motto was “you can do hard things!” I have been thinking that a lot lately. Thank you so much for your encouragement! Another resource I found incredibly helpful for encouragement when you’re living on less is Kimberly Eddy’s “Thriving on one income. (http://joyfulmomma.com/thriving-on-one-income-softcover/)” I believe I got it as a package ebook deal way back in the early days of Crystal’s blog, along with some other GREAT ebooks written by Crystal on her supermarket savings course and centsible breakfasts and dinners (hint hint – it would be great to see it again when your life settles down, Crystal 🙂 – I’m sure you could even sell it and put the proceeds toward your Compassion project). I love reading material about stretching your income during the lean times, and finding the joy in those times as well. It would be fun sometime for there to be a link up post on people’s stories on how God has blessed them during these times or something they’ve gained from the whole experience. Thanks so much for sharing Jason & Holly’s story! It was a great read! Wonderful words of encouragement! Well done. Things have been rough for me too lately, but I’m blessed to still be doing well enough to continue working from home. I’m just glad I had the foresight to pay off my debt when I was making a lot before I lost my job. Thanks for the inspiration! Thanks to all of you who are willing to share your stories of faith, sometimes struggle, and your positive words! You help people even when you don’t know it! thank you so much for this encouraging post, needed it! So true! Thanks again for another inspirational post! I love your blog and look forward to reading your latest posts. You’re great! I have to admit that I read that article and very little empathy for the man. Taking a $70,000 pay cut didn’t seem too bad if it still left him with $70,000. In that position, although he had some good insights, I didn’t find that he was one that was particularly helpful to me in making things work for a family of 5 on an income that was still half of his, after his cut. Thank you for the tips you give- keep them coming. My income was cut in half last February when my husband was arrested for DV and then slapped me with divorce papers. I was doing great with 2 incomes and had worked out a comfortable budget that was working for all of us before this happened. As much as I always wanted to stay home with the kids, I am glad that I worked out of the home so I wouldn’t be scrambling to find work now. Dealing with the loss of my marriage and half of my income at the same time has been horrible. I thought things financially were tough before. Things can always be worse. I don’t even stress as much about money anymore, I am just trying to stay healthy and keep my sanity. On a good note. I won a copy of Crystal’s book on a blog and it arrived yesterday! I was so happy. I have been reading the blog since I was pregnant with my 4 yr old. I was stumbling on ways to save when I was home for a few weeks from morning sickness and found the site. I think I have checked it almost every day since. Woohoo! I’m so glad you won–and thank you for reading here! I thought the same thing. There isn’t anymore that I can cut out. I clip coupons, I sew my own clothes, I hang my clothes up to dry, I share with people to help them out. I do mending for others, I barely find time to rest let alone relax, and yet my brain is on to the next project to help with expenses. I’m weaving baskets to sell! There is always something else we can do – IF you really want to! God is good! Thanks for the perspective… I have to admit I read the article cynically (my usual state, sadly)- and kept thinking to myself- they still make 70 grand! they don’t have children! on and on. But this is a good perspective- and one my husband would have brought up. Money is tight, as usual. My husband is stuck in his job. Sometimes the future is bleak… and our bank accounts are very sad looking. But God has never left us without food, shelter, heat, and our family. “4Rejoice in the Lord always; again I will say, rejoice. 5 Let your reasonableness be known to everyone. The Lord is at hand; 6 do not be anxious about anything, but in everything by prayer and supplication with thanksgiving let your requests be made known to God. 7 And the peace of God, which surpasses all understanding, will guard your hearts and your minds in Christ Jesus. Also I got your book yesterday AND LOVE IT! My whole family (6, 8, 10, 15, Hubby & 16yr old Yorkie) is on board which is great as we only live off of my pay check since we lost our jobs 4 yrs ago when General Motors closed. This has been a curse and a BLESSING. Thanks for all your helpful Blessings thru your post. I am Thankful for you and your site. (I am tearing up. sniff sniff) You post your heart on your blog in order to help my family and many others, for this I am forever grateful. I cried as I read this….thank you for what you do and the example and encouragement you are. We got our foreclosure notice today. I just don’t know where else we can save. I feed our family of six on $200-400/month. This includes all. Diapers toilet paper ect ….all shopping clothing. My husband is bringing hone about $2400 a month. We are only $6000 in debt except the house but there are so many different payments with so many companies. Our credit is shot so we can’t consolidate. And yes I have negotiated with everyone several times to lower payments. If we can just figure out a way until our tax refund gets here I think we’ll be fine. But it looks so bleak. We are so close!!!! We have paid off $24,000 but it may all be for nought if they forclose. I don’t have much fight left in mlorut I’m clinging to the lord. Thank you again for these words of encouragement. I just wanted to say that you can do this. Do not let yourself be defeated. My husband and I paid more than this off in about a year and a half (maybe slightly more). We make under $30K (our net income was usually less than $2k month). I am home full-time due to health and we don’t have debt and are able to pay our bills. We live very frugally – no cable, no vacations, etc. but we have all that we need and even a bit more. If you can, focus on the small debts first, paying each one off as you can. Then apply that money to the next debt and so forth. It will give you encouragement to see a few bills go away quickly to keep persevering. Some people apply this principle with the highest interest rates first, but I found that we were more encouraged by paying off smaller amounts first. We had consumer debt and medical bills and focused on the medical bills first as they are not as easy to work with and won’t wait. We paid only what was necessary on the consumer debt and then slowly added more as the medical bills got paid off. If you can catch up on your mortgage, that is most important. You need a place to live, first and foremost, so try to save your home if you can. Try to get your food bill as low as you can. You mentioned a range of $200-$400/month. Try to keep it on the lower side. Look at this as a challenge (make and set goals) and be determined not to spend more. Any money you have leftover from food can be applied to bills. Do not shop for anything that is not a necessity. And if you really need something, buy it the least expensive way possible. I don’t know your other bills, but go over everything with a fine-tooth comb, and cut out anything you can. I am sure that $6,000 plus your mortgage seems impossible right now, but it’s not. Little by little you can do this. And yes, we used our tax returns to pay down our debt in the past. Do not spend it on anything else, except for a small portion to put aside for emergencies perhaps. What helped us the most was to apply every little bit of extra money to debt, it made a real difference for us. Extra cash did not mean “extra to spend”. I wish you the very best! I am in tears as I write this, but…thank you. Yes, we took that 70 thousand pay cut almost 8 yrs ago. We were left with 30,000. Jobs have come and gone,but we have the house. That was the first priority for me. I can not lie, i still struggle because now his income is guaranteed at 12,000. Thank god my job is..so far steady. We are not getting ahead even an inch and my health is slipping now. I know it is stress induced, i try to remember the good and to be greatful, but anger seems to come first. But reading others struggles remind me i am not alone. I keep asking I hope to see the MSM write on how to stay encouraged when you only have your income and no kids or spouse to encourage or give you reason to keep trying. It is pretty depressing. Thank you Crystal. This post is a great encouragement to me. I hope I can remember this sentiment all year long. Thank you so much for these kinds of posts. I need them right now. And it is true that laughing and singing will help you get through. I love your blog. Your words always help me out. Sometimes I feel so lost and confused and wonder how people manage it. We have never had allot of money and we work hard, but just never had allot to begin with. Now were dealing with even less and the credit card debt is swallowing us whole it feels like. We are scrimping just to take my son camping. I feel like a failure sometimes because I’m the one not bringing in as much as my husband. I had back surgery and it’s been hard to get my strength back with the weight I have gained and just being depressed in general. Thank you for your blog and y our advice. I’m in that place right now. 2nd lay off in less than a year for my husband is he sole provider of our family of 6. I just don’t know what to do. I picked up a babysitting job life is so stressful right now. Seeking God for guidence. I LOVE this! It is so very true. Never give up! We are living on one income right now & money is tight. I am a Pure Romance consultant and am working hard to get it up & running as well as a new craft buisness. Is it hard? yes. Is it tiring? Yes! But it is worth it because I am able to stay home with my youngest son, go to my oldest son’s events (without having to request time off) & I am getting to spend time with my mom who’s health is failing. I figure I can stress over money being tight or I can be thankful for all I have. Positive thinking always gets me further ahead and I feel better. Keep working & stay positive! Mini Backpacks for just $17.99 shipped! Aromatherapy Necklace for $4.99 shipped! Charmin Essentials Strong Toilet Paper, 48 Giant Rolls only $23.24! Smart Wristband with Heart Rate and Sleep Monitor only $6.60!